One of the most unique slots in the PlayNGo portfolio, Leprechaun Goes Egypt blends Irish lucky with Egyptian style graphics giving players plenty of opportunities to plump their bankrolls. Leprechaun Goes Egypt is played just like any other slot as it is based on standard slots rules. The slot comes with 20 paylines. To get started, players should first activate as many or as few of the lines as they please. The slot allows a maximum bet of five coins per active payline. 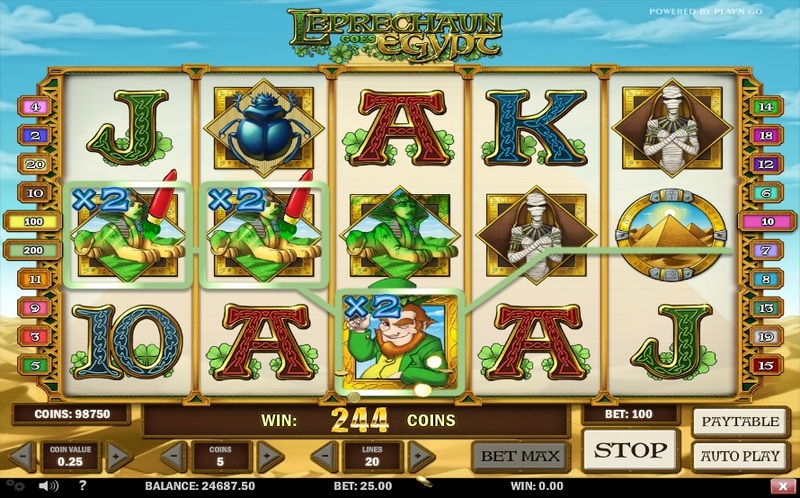 Since the slot has a coin value range of $0.01 to $1.00, players can bet anywhere in the range of $0.01 to $100, which makes Leprechaun Goes Egypt an ideal slot for high rollers as well as low rollers. If players want to bet the maximum of $100, they just have to hit the Bet Max button. The next step is to click on the Spin button to set the reels spinning. If a winning combination of symbols is displayed at the end of a spin, players will get paid according to the game’s payout structure. If not, they can place another bet and try their luck once again. Players can also take advantage of the slot’s Autoplay feature for the ultimate gambling experience. PlayNGo had originally designed Leprechaun Goes Egypt for Unibet Casino; however, players can now play it at several online casinos. The slot is about the experiences of a leprechaun who is on vacation in Egypt. PlayNGo has cleverly combined the Irish and Egyptian themes to give players a unique slot. The leprechaun plays a variety of pranks in Egypt. He paints the pyramids green, has beer with an Egyptian mummy, squashes a scarab, and converts Queen Cleopatra into an average Irish girl. The slot promises plenty of fun, entertainment, and prizes. Leprechaun Goes Egypt has three delightful bonus features. If players land the Pyramid symbol simultaneously on the first, third, and fifth reels, the Rescue Cleopatra feature gets activated. Players then have to rescue the Egyptian queen from the treasury by clicking on the correct doors. Whenever they click on a door, players will be rewarded with cash prizes. However, if they reveal a mummy, the game comes to an end. Players can win up to 500 coins in this delightful feature. The free spins bonus round gets activated by the appearance of at least three Cleopatra symbols across the reels. Players can then choose from three different free spin modes—Cleopatra, who offers five free spins with a multiplier value of x6; the leprechaun, who offers 10 free spins with a multiplier value of x3; and the mummy, who offers 15 free spins with a multiplier value of x2. Leprechaun Goes Egypt is available at all casinos that offer PlayNGo games. Pokie Features Wild symbol, scatter symbol, free spins, multipliers, bonus game.